Is Android OS upgradable and why am I not getting the updates? Over the past few years Google has released several versions of Android with new features and performance improvements on every update release. There have been eight Android updates (Cupcake, Donut, Éclair, Froyo, Gingerbread, Honeycomb, Ice Cream Sandwich and Jelly Bean) since 2009 with another one in sight (Kitkat). It is a common question to see people ask “can I upgrade my Android OS?” “Is Android OS upgradable” “How can I upgrade my Android OS?” etc. We all want up-to-date gadgets so we could get the latest features on our devices. New updates often come with less bugs as every Android updates introduces new features, enhances functions with most known bugs in the old versions fixed. So to answer the question “is Android OS upgradable ?” YES! Android OS is upgradable. Unfortunately some Android devices will not get the updates and its often disappointing to find out your shiny little device won’t be getting the latest updates. Just recently the BBM for Android app was released for Android devices running on Android version 4.0 and above but there is a large chunk of people using devices running on Android version 2.3 Gingerbread out there, imagine how you will feel to know you cannot be able to install and use this app just because you cannot get the latest version of your device’s OS update. Why am I not getting the updates? Different Android devices use a wide variety of different hardware and different device manufacturers have different device drivers to ensure Android runs smoothly on their devices. So part of the reason you may not be getting the latest Android OS updates is because your device manufacturer may not have released the updates for your device. 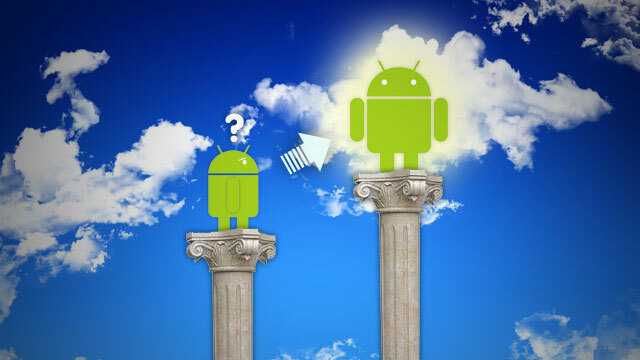 Secondly, some new Android OS versions require a higher hardware capacity to run smoothly. So if your Android device does not have the minimum requirements to run such Android version, you won’t be getting the updates. Furthermore, your local network carrier may delay updates for months and you may not be getting your updates for these reasons. But is there any other ways I can get the latest updates to run on my device? Yes, even if you cannot get the official updates because of one or more reasons discussed above, you can still get the latest Android versions to run on your device. But note it may not run as smooth as you may want due to hardware limitations. Android operating system is an open-source software which means anyone can develop anything on it for free. There are a lot of Custom ROMs developed by some Android geeks you can use on your device. You can find more information about custom ROMS for your Android device at the XDA Developers forum. Note you may have to void your device warranty when you “root” your device as needed if you are to install such Custom ROMs on your device. Rooting will give you the required permissions to begin tinkering with the OS. Its good to be at netmediablog again and I must say the visit is not regretted. I have been battling with this question for some time and your answers were satisfactory. Thanks for your compliment & am glad you find my blog informative. I was looking for such information and you solved my problem by providing such nice information. I like your blog so much i have bookmarked it for future reference. Thanks Adnan i hope you visit always. Wow, That’s wonderful info, I was looking for information like this. Because, Now. Android is going to release Kitkat version and i still had that dumb Gingerbread version. Hopefully, There’ll be some application or TUT to root my mobile. I’m a great fan of Android OS since its initial days…..I have upgraded my Android OS many times, actually it helps to stay protected against the malwares and enjoy all the new features….but its true k some of the devices are not that much easy to update….You have mentioned XDA Developers here….I learned many things from that forum…its awesome…. What phone model are you using? Glad you totally agree with me that XDA Developers forum is awesome. i was trying to find such stuff my HTC Desire Z and finally got the right place. i m going to give it a try. keep this good work. This is a common question and problem for all the Android users. Thankful to you Nwosu Mavtrevor for solving our problem by providing such a useful information to all of us. If all phones were upgradeable, manufacturers would lose out on sales. I think its pretty selfish of them.